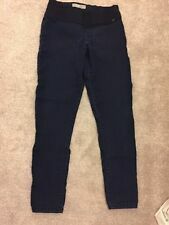 Topshop Black Leigh Maternity Jeans 12 L30 Skinny Under Bump. Condition is Used. Dispatched with Royal Mail 2nd Class. 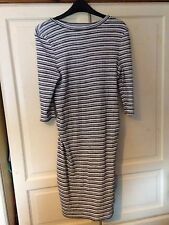 Asos maternity dress size 10. Condition is Used. Only worn once for a hen do this April. It’s a lovely cornflower blue colour and I had lots of compliments on the colour. Sadly I don’t have any more occasions to wear it to hence why I thought I would sell on so it can be worn again this summer. Button fastening to the back neck. Invisible side zip. I am 20 weeks pregnant in the photo, but would suit bigger bump also as very roomy. Arms are quite loose fitting too. Dispatched with Royal Mail 1st Class. 7 Breastfeeding Nursing Vests Size Small 8/10. Condition is Used. Dispatched with Royal Mail 2nd Class. There are 3 white, 2 black, 1 navy and 1 grey. They are all used so not in perfect condition but have life left in them. 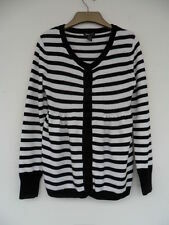 From a variety of brands such as next, Mothercare and new look. 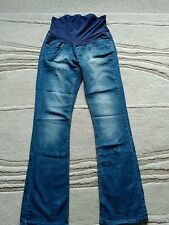 H&M Mama Pregnancy Blue Breton Top Medium. Condition is Used but good Dispatched with Royal Mail 2nd Class please see my other items! 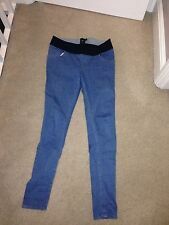 Topshop Leigh Maternity Jeans Size 10 Leg 30 Blue Skinny. Condition is Used. Dispatched with Royal Mail 2nd Class. Dress 99% cotton 1% viscose made in China. Both machine washable, dress tumble dryable. Maternity dress 10 Isabella oliver Summer Baby Shower size 2. Condition is Used. Dispatched with Royal Mail 1st Class.